Spinning became popular in America in the late 1940s. It is unique because the reel is mounted on the underside of the rod—rather than on top, as in other methods—and because the reel spool remains stationary (does not revolve) when the angler is casting and retrieving. In operation, the weight and momentum of the lure being cast uncoils line (usually monofilament, fluorocarbon, or braid) from the reel spool. Unlike conventional revolving-spool reels, in which the momentum of the turning spool can cause backlashes, the spinning-reel user has no such problem, for the line stops uncoiling at the end of the cast. A beginner can learn to use spinning gear much faster than conventional tackle. 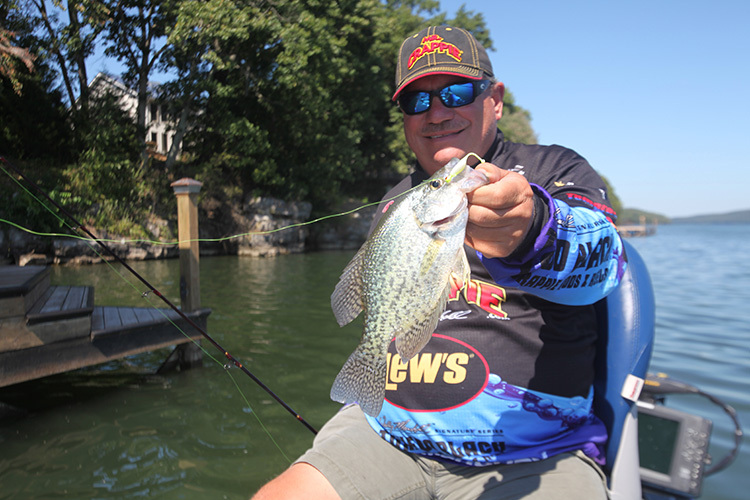 Still another advantage of spinning gear is that it permits the use of much lighter lines and smaller, lighter lures than can be cast with conventional equipment. On a standard open-face spinning reel, the pickup mechanism is usually of a type called the bail—a metal arm extending across the spool’s face. 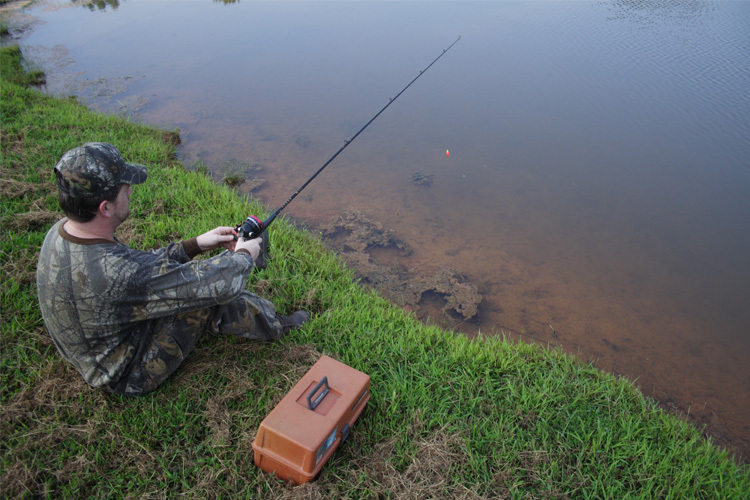 To cast a lure or bait, the angler opens the bail by swinging it out and down. This frees the line, which, as a rule, the angler momentarily controls with his index finger. 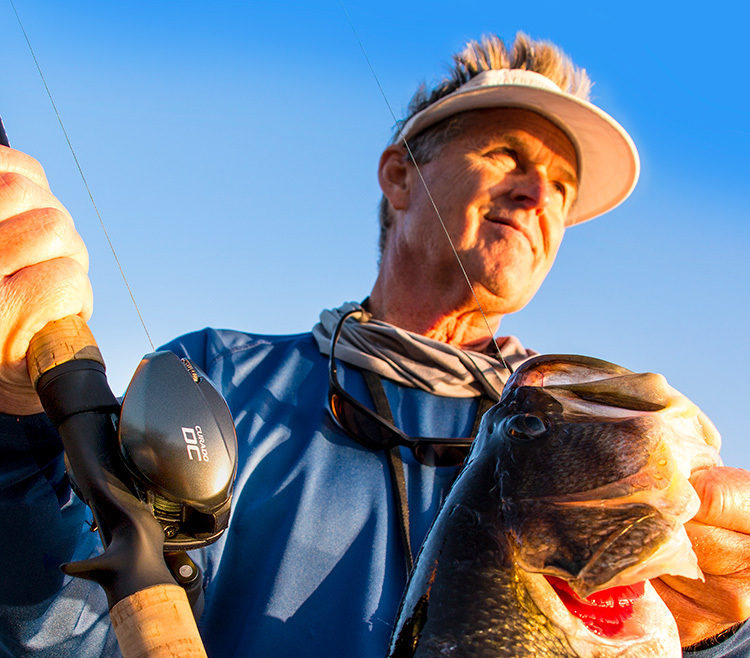 He casts and then cranks the reel handle—not a full turn but just a small fraction of a turn. This snaps the bail closed, engaging the line. Other devices on a spinning reel include the drag and the antireverse lock. The drag, an adjustable mechanism usually consisting of a series of discs and friction washers, is fitted on the outer (forward) face of the spool or at the rear of the gear housing in most reels. The drag permits a hooked fish to take out line without breaking off, while the reel handle remains stationary. The antireverse lock, usually a lever mounted on the gear-housing cover, prevents the reel handle from turning in reverse at such times as when a hooked fish is running out or when you are trolling. Spinning reels are designed for all types of fishing. How does the beginner select the right one for his particular needs? 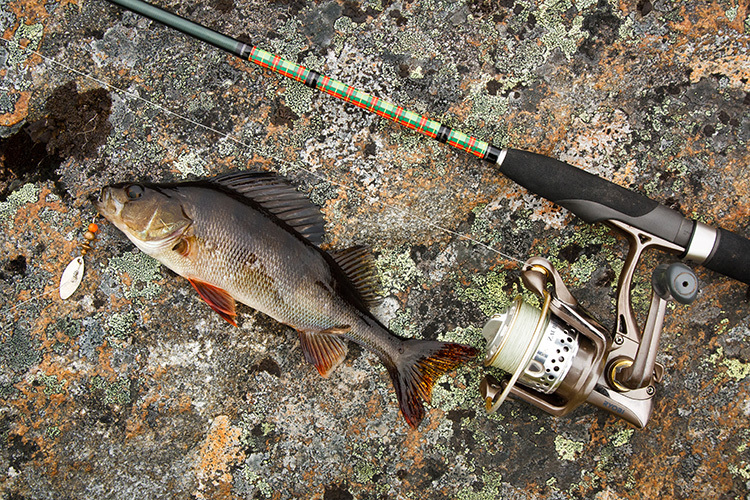 A reel’s weight and line capacity are the major determining factors. For ultralight fishing with tiny lures (1⁄16 to 5⁄16 ounce), a reel weighing 5 to 8 ounces and holding about 100 yards of 2-to 4-pound-test line is the ticket. Reels for light freshwater use weigh 8 to 10 ounces and hold up to 200 yards of 6-or 8-pound-test line. Reels for general freshwater and light saltwater use weigh 12 to 16 ounces and hold up to 250 yards of 8-to 15-pound-test line. Heavy offshore and surf-spinning reels weigh upwards of 25 ounces and hold a minimum of 250 yards of 15-pound-test line. These yardage capacities are for monofilament or fluorocarbon line. Smaller-diameter braid line will usually increase these capacities on most reels. In addition to the open-face spinning reel, there is a closed-face design. This type, too, is mounted under the rod. Its spool and working parts are enclosed in a hood, with the line running through an opening at the front. The pickup mechanism is normally an internal pin, and there’s no need for a bail since the line control is accomplished by other means. In some of these reels, which were fairly common at one time, line was disengaged from the pickup by backing the handle a half turn. In others, it was accomplished by pushing a button, working a lever or disc, or pressing the front reel plate. Closed-face reels are still available, but are no longer common. Besides eliminating the bail, closed-faced reels give the spool and other parts some protection from the elements and help to keep out sand, dirt, and the like. Some fishermen, however, dislike the fact that the line is choked through the constriction at the point of the cone, feeling that this arrangement somewhat limits casting range and accuracy. Another drawback is that the hood enclosing the spool hides the line from the angler’s view, preventing him from seeing line tangles and whether or not the line is uncoiling smoothly. Mainly because of the simplicity of spinning reels, there has been little gadgeteering by manufacturers. However, some unusual features have appeared over the years. These have included bails that open automatically, self-centering (self-positioning) bails, rear drags, and skirted spools, which prevent line from getting behind the spool. There are spinning rods designed for every conceivable kind of sport fishing. They come in lengths from 4 to 13 feet and weigh from 2 to 30 ounces. Most are constructed of fiberglass, graphite, carbon, or Kevlar. 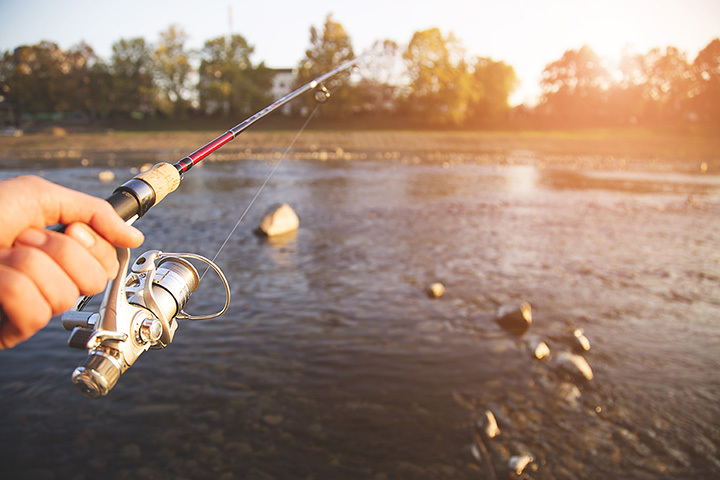 Construction is usually one, two, or three pieces; however, some spinning rods designed for backpackers may have as many as a half-dozen sections. 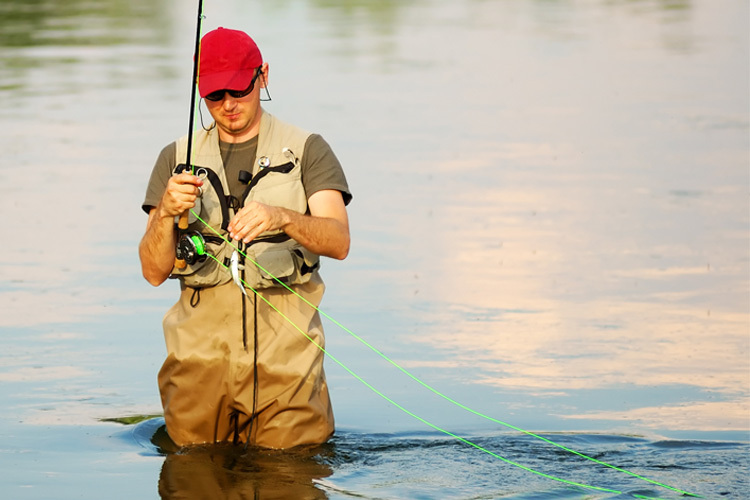 Spinning rods fall into five general categories: ultralight, light, medium, heavy, and extra heavy. They are further broken down according to the type of reel and design of the hand grip.